In primitive societies teeth were extracted with a chisel-shaped piece of wood held against the tooth and pounded with a mallet. Early Chinese tooth-pullers used their fingers. 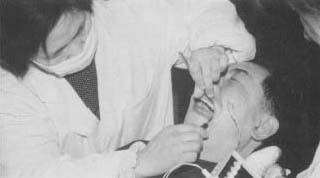 These oriental dentists developed the necessary strength in their fingers for this task by spending hours pulling nails out of planks. Around 300 A.D. the ancient Greeks used double-lever forceps to pull teeth while the Romans used forceps of various designs. These designs included a thin-root forceps and pliers to remove small pieces of tooth. Abulcasis (963-1013), an Arab surgeon from Spain, illustrated a number of dental extraction devices in his eleventh-century Treatise on Medicine and Surgery. These tools included elevator chairs, forceps, and lancets for loosening the gum. In fourteenth-century England barber-surgeons regularly extracted teeth. Their familiar red-and-white barber poles were sometimes adorned with teeth they had pulled. Those poles were combination shop signs/advertisements used to indicate that they would also bleed the sick. In 1481 Johann Schrenk of Germany used and described a form of forceps called a pelican. A similar device was illustrated by famed French surgeon Guy de Chauliac (circa 1300-1370). Renowned French surgeon Ambroise Paré (1510-1590) used a three-instrument approach to tooth extraction. This included a root-exposer to loosen the gum, a pusher to ease the tooth out of its socket, and a pelican to lift the tooth out. In the late 1500s Fabricius (1537-1619) described nine different pairs of forceps. Most were named for the mouth or beak of the animal or bird they resembled. In 1525 Thomaseus devised a heavy-toothed forceps. Acupuncture is used as an anesthetic during a tooth extraction procedure. In the 1600s Dutch surgeon Anton Nuck advocated anatomical dental forceps. These were designed to fit the shape of the teeth they were to extract. Cyrus Fay, an American dentist practicing in London, built the first anatomical forceps in 1822. In 1841 John Tomes (1815-1895) of London also designed anatomically based forceps. Tomes's instruments were made by French toolmaker Evrard (1800-1882). 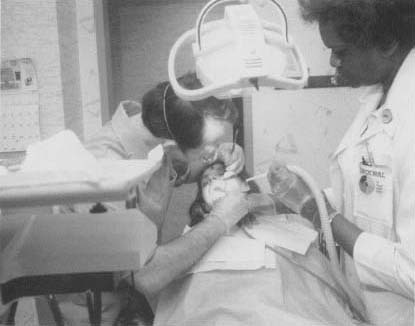 A patient has a tooth pulled. In the mid-184os Americans Horace Wells and W.T.G. Morton used the first general anesthesia for tooth extraction—a mixture of nitrous oxide, or "laughing gas," and ether. key and the new vertical tooth-extracting devices which pulled the tooth straight out. An improved elevator chair introduced by French dentist Lecluse in 1750 was still widely used well into the twentieth century. J. J. J. Serre of Vienna designed a screw for removing root remnants in 1790. Serre's tool (with certain modifications) continued in use into the 1900s. In the mid-1840s Americans Horace Wells and W. T. G. Morton used the first general anesthesia for tooth extraction— nitrous oxide ("laughing gas") and ether. i neeed more informations about pediatric dentistry!!! I had 4 molars exrtacted along with 4 pre molars so that's 8 in one sitting. I was completely unconscious under the influence of intervaneous anhestisia and didn't feel a thing. My after math doesn't hurt at all and the blood you have to deal with when you get home is annoying. But﻿ after a couple of hours, you really don't feel any pain of you take pain killers. It's hard to eat food tough! I think this info was a little helpful.